Chaplains from across the country will meet in Liverpool this month at their Biennial School Chaplaincy Conference to discuss and reflect on their work. 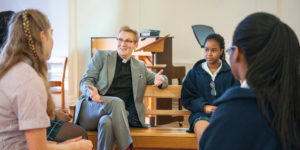 By far the greatest number among them will be chaplains from independent schools, with around half of the estimated 250 chaplains from the sector expected. A chaplain and their chapel ? in some cases for several centuries ? have been at the heart of our independent schools, a personification of the vision and values of a school: yet chaplaincy has in the past been called ?the hidden ministry?. What is a school chaplain" A chaplain is a member of the clergy attached to a private chapel or institution like a school, university, hospital or the military. They provide a listening ear and give spiritual support to everyone throughout the school, including pupils, parents, staff and alumni. They welcome those of all faiths ? and none ? and are often part of the teaching staff. With The Bloxham Project ? the last detailed school chaplaincy research in 2011 ? finding that while ?its potential impact on the lives of the young is considerable, the Church needed to do more to recognise that? ; today?s chaplains are adamant that their role is more vital than ever.